Read here about tensegrity structures composed of seven struts, part of a series of pages organized by strut count. Seven strut tensegrities are rare. Kenneth Snelson put barsSnelson, Kenneth in a bag, forming a mesh bag tensegrity. One photo published on the web features 7 struts. 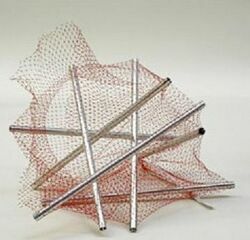 Mesh bag containing 7 tubes, by Kenneth Snelson, Mesh Bag as Tension Network. 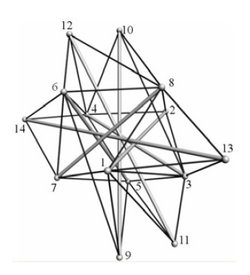 In "Structural Morphology Of Tensegrity Systems" Motro applies a free-form method of discovery to the generation of unusual tensegrity forms. The 7 strut is generated in a series from 4 to 8 struts. He wrote, "The process is started from a simple system and, next, more and more struts and cables are added step by step." This page was last edited on 25 September 2018, at 09:45.